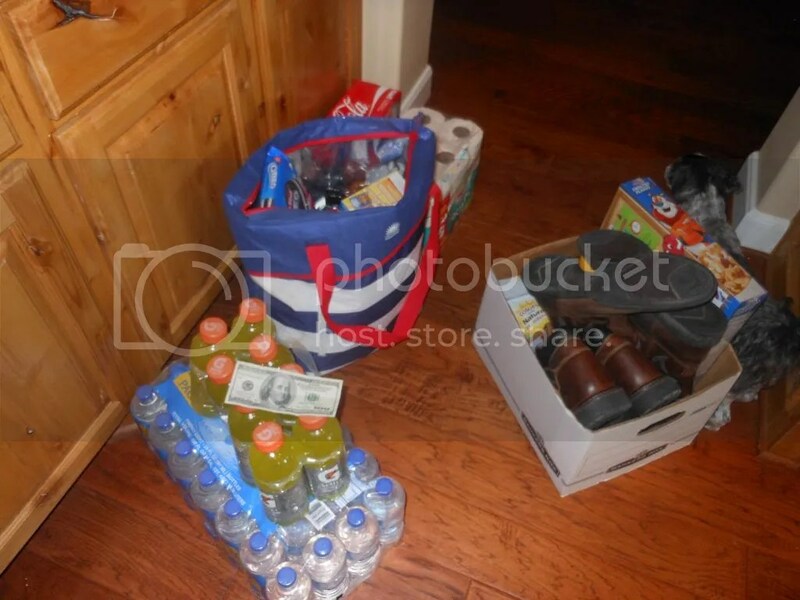 Packed up the Aggie with food, boots and moola. Kindly note that the moola laying on the top was not for the picture. It was for the forgetful Aggie who called when he got back to TAMU to ask me to bring the hamper full of his clothes that he forgot. I forgot to include all the fajita meat in the freezer. Shhhhh, I keep those things quite. Then I went out to the garage, aka shop, to forget that the Aggie was leaving again and summer has ended and I miss him and I love him and I wanted him to grow up and be independent and responsible, but I didn’t know it would hurt so much…..so I chalk painted alllllllllll day long. My younger son helped me. I think he knew what I was up to and was a little sad himself, probably because he has already started school. These are Duncan Phyfe Tulip Back chairs, still sturdy, but a little worse for wear on the finish. I taped them off so that I could preserve the insert and allow the beauty of the old wood finish to be seen. 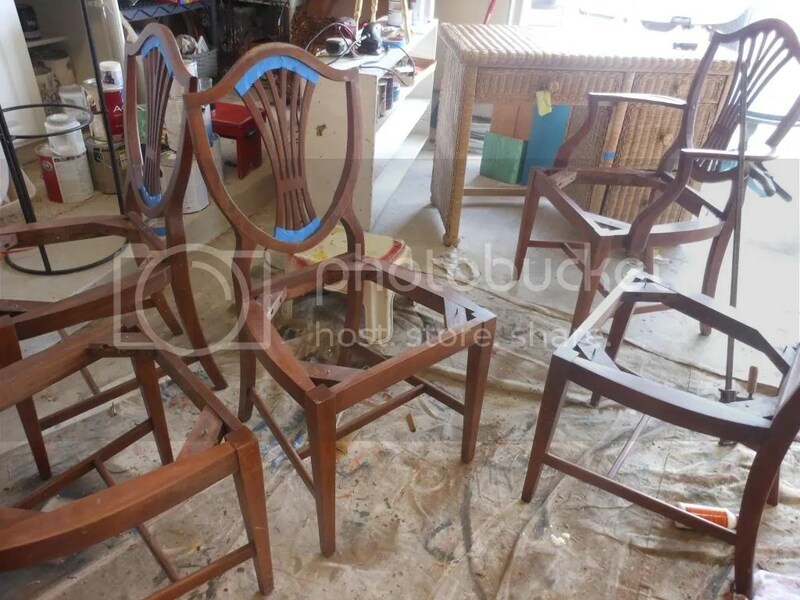 The better part of the day was spent on the detailed painting of the chairs. My youngest son made lunch. He was really taking care of me today. We had salad and baked chicken breast and he painted, too. These lovely chairs have a drop leaf double pedestal table with two leaves still with the table to go with them. I am thinking about keeping it which would create an interior avalanche. You know how those things work. You place a new piece in the room and you love it and then you notice some things in the same space that you don’t love so much and decide to change those too and your husband comes home and wonders aloud, “What was wrong with the old table?” You ask yourself the same thing, but never admit it out loud. This has been a tribute to “Keepin’ It Real”. I thought it might be nice to see how chalk painting takes shape outside in the shop, aka garage, which is very messy and needs a good organizing session with a professional organizer. Let me know if you know of a professional organizer who will take on an Irish Lady who chalk paints like a little kid making mud pies. P.S. 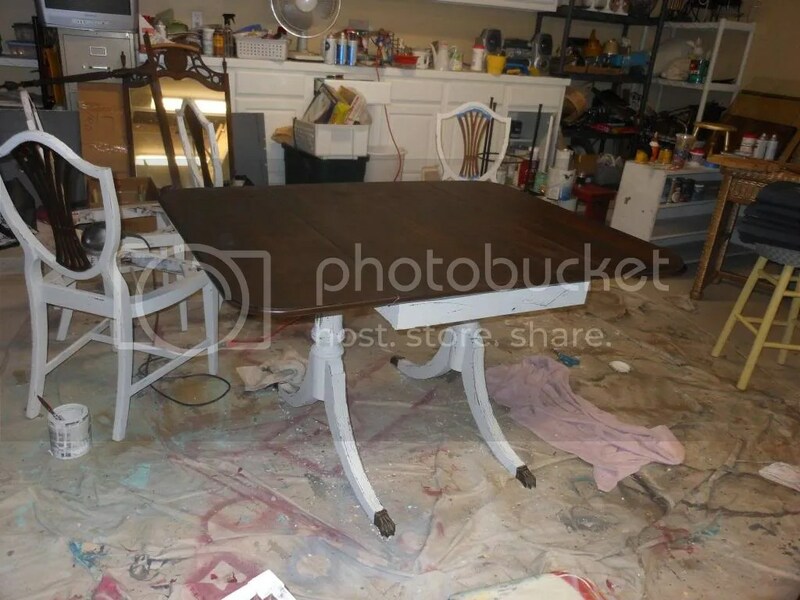 I’ll try to remember to take a nice photo of the table and chairs when I figure out where they will land. Keeping busy helps. Missed your comments. Hope you are well.